Have you seen this super colorful and temping ice cream anywhere on social media? 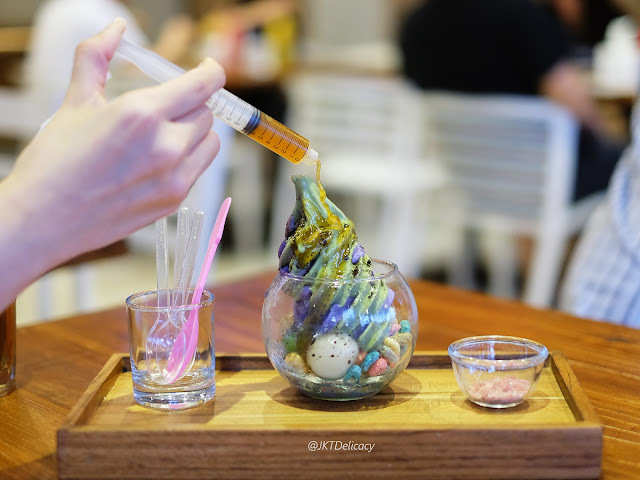 I've seen it so many times on my Instagram wall where food bloggers posted it. And so, I decided to visit this place and had a try. This is called Boo Ya! 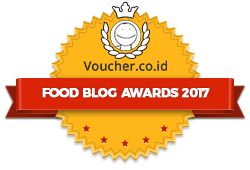 (IDR 39.000 Nett). 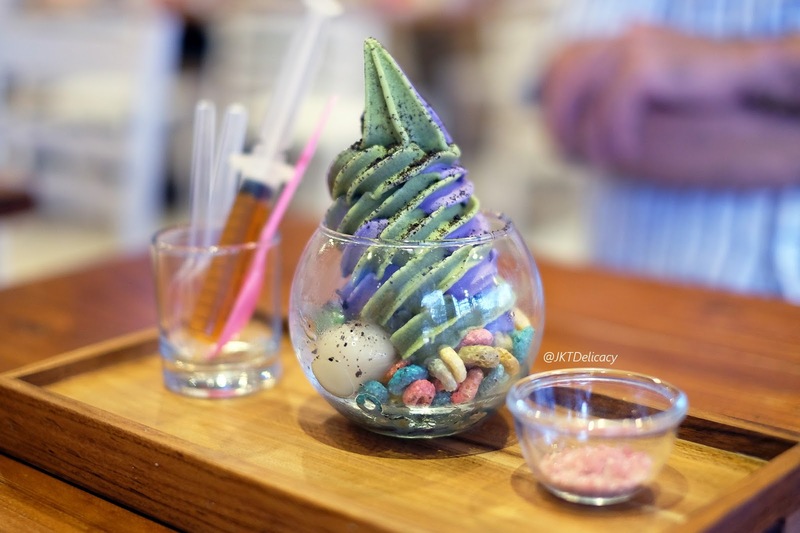 Basically its a mix between Ice Cream with a lot of toppings, such as Shiratama Balls (Similar to Mocchi), Fruit Loops (Colorful Cereals), and Pieces of Oreo. For the ice cream, you can choose Taro / Matcha / Mix Both Flavors like mine. But, personally I recommend you to choose one of them, not mixed because you can't really taste the original flavor. 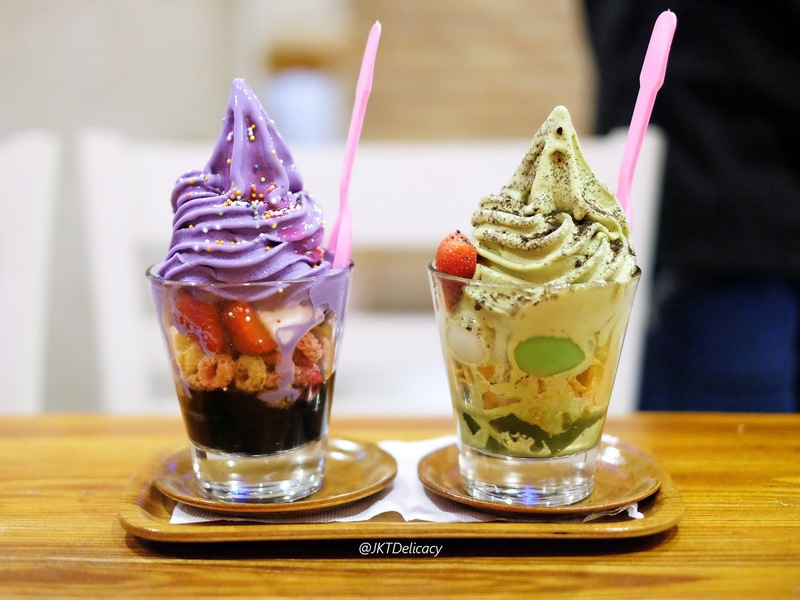 The Taro is typical Sweet Taro flavor, while Matcha is a green tea flavor with a signature green tea bitterness and less sweet than Taro. What makes this Boo Ya! 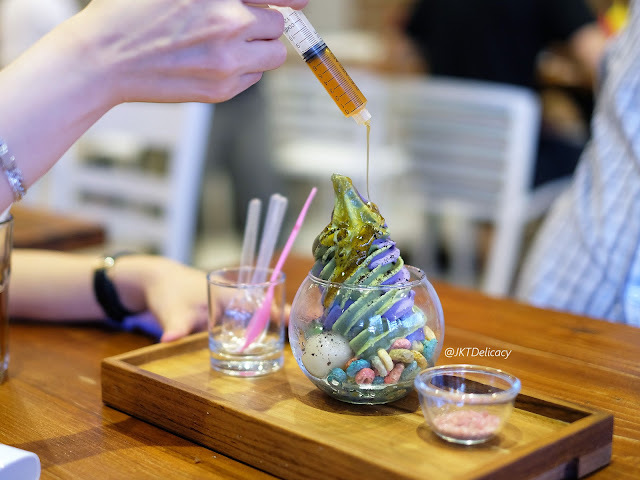 interesting is that it comes with an injection of Honey that you can pour over the ice cream, and a POP ROCK sand like sugar that gives you explosive sensation in your mouth (If you remember in late 90s, there was a candy with this explosive sugar dipping). Berry Go Round is a combination of one choice of ice cream (Taro / Matcha) and some toppings like Fruit Loops (Colorful Cereals), Strawberry, Marshmellow, Strawberry Syrup, Rainbow Dust, Grass Jelly (on the bottom) and Pocky (but I think they forgot to put the Pocky stick). 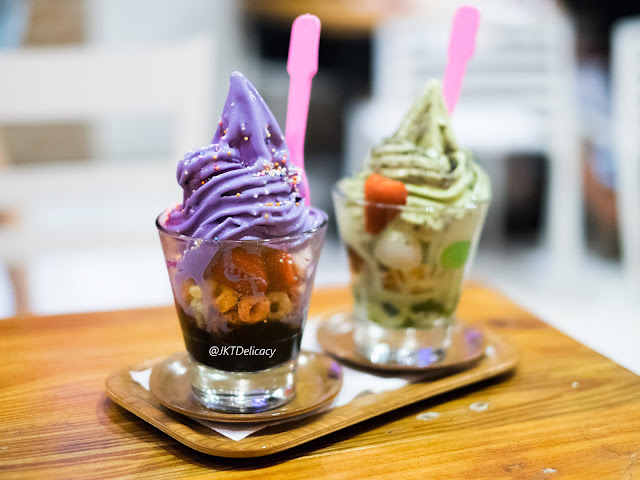 I like the grass jelly because it was sweet, and the sweetness of the Taro Ice Cream really blends perfectly with the other toppings. 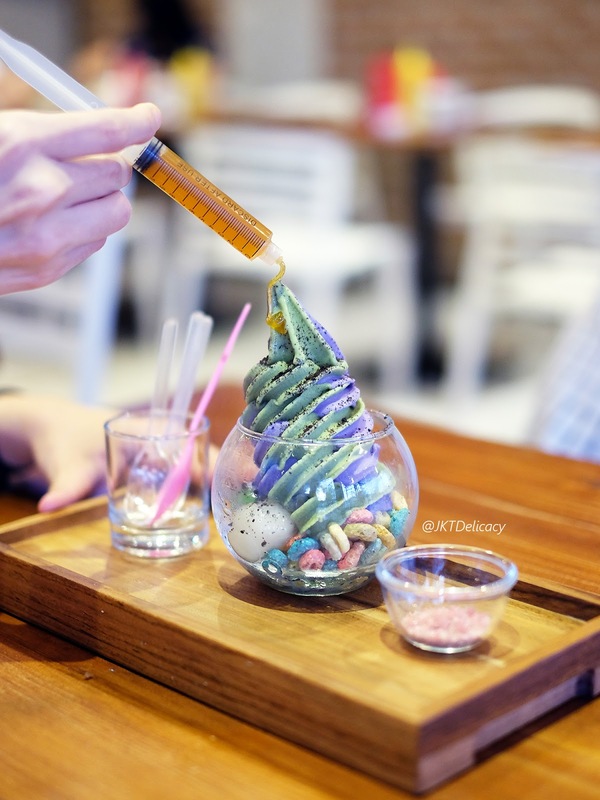 Matcha Ogura is a combination of one choice of ice cream (Taro / Matcha) and some toppings like Shiratama Balls (similar to Mocchi), Red Bean, Cornflakes, Caramel Syrup, Lychee Jelly and Rainbow Dust. I personally don't prefer those combinations especially the cornflakes. 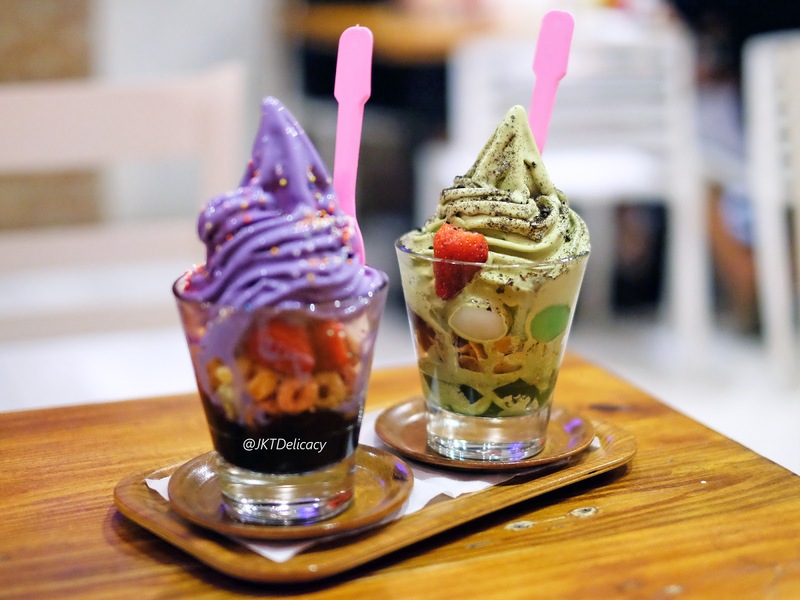 And as I said before, the matcha ice cream was less sweet than the Taro one. Above is the full menu. 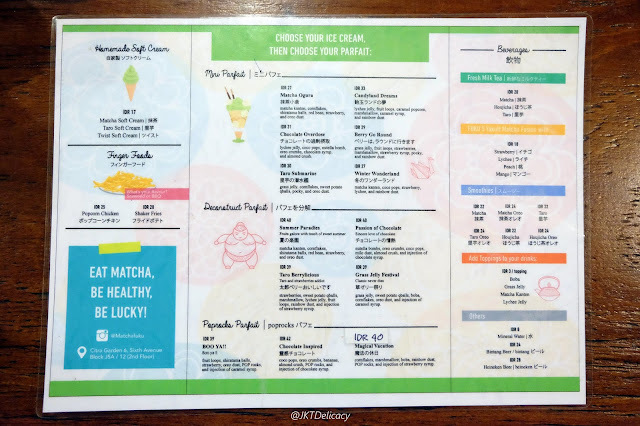 If you read my previous review (post), I have mentioned that Matchafuku is located just above Meaters Steak and Ribs Restaurant on the 2nd floor. You can order this dessert on the Meaters Restaurant, but the billing will be seperated. Unfortunately, I tried all these ice cream on the first floor, not on the Matchafuku. So, I couldn't take photos of the interior. But overall, their ice cream was so yummy!